From Nikolai, the trail runs west to McGrath. The terrain is mostly flat. The trail passes through open swamps, small stands of spruce and alder and runs on the river itself. There are no grades to consider. This section is well traveled and should present no problems unless deep fresh snow is encountered, at which time the trail is very soft. McGrath is a major staging area and many trails run out of town. The Iditarod will be well marked to prevent confusion. McGrath (muh-GRATH) — (McG) Lat 62.57 Long 155.36 — Population 341– Located near the confluence of the Kuskokwim and Takotna Rivers, this thriving community has two stores, a bar and a restaurant. It’s the last chance to buy aviation gas, except for Galena, until you reach the coast at Unalakleet. Lodging is also available with advance booking. 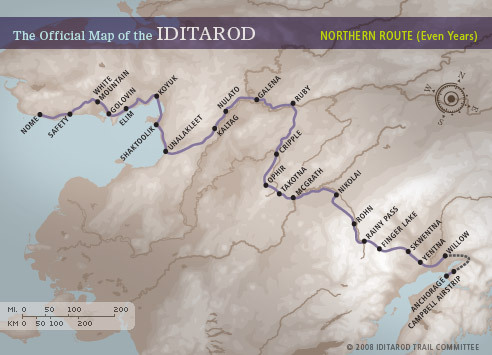 I will be covering the Iditarod everyday on my website and on the radio. Please listen in. Please like us on Facebook and follow us on Twitter and check in with me on Foursquare.